Component 1 : “On-the-ground demonstration”. 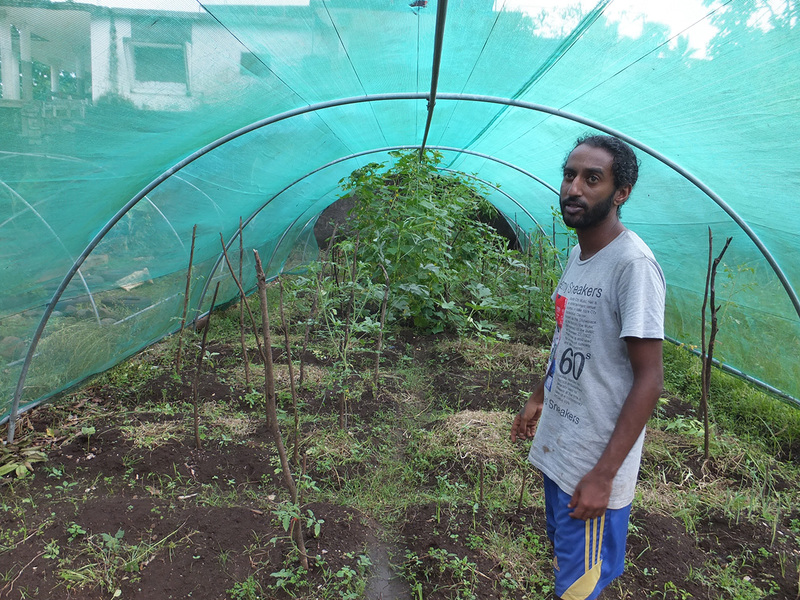 The GEF-Satoyama Project invests in demonstration projects in Indo-Burma, Tropical Andes and Madagascar and Indian Ocean Islands Biodiversity Hotspots to enhance livelihood, conservation and sustainable use of biodiversity and ecosystem services. Intended outcome include effective conservation management in these areas, improved conservation status of globally threatened species and protection of traditional knowledge. The demonstration projects have been selected through Calls for Proposals in the three regions. The proponents of these projects are our partners to achieve the goal of the GEF-Satoyama Project; i.e., the society in harmony with nature. Globally, Indo-Burma ranks among the top 10 hotspots for irreplaceability. 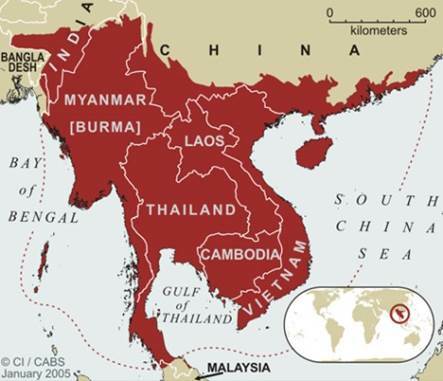 The region encompasses more than 2 million km2 of tropical Asia, covering Cambodia, Lao PDR, Myanmar, Thailand and Vietnam, as well as parts of southern China and eastern India. A wide diversity of ecosystems is found including evergreen, deciduous, and montane forests. There are also shrublands and woodlands on karst limestone outcrops and scattered heath forests. In addition, localized vegetation formations include lowland floodplain swamps, mangroves, and seasonally inundated grasslands. Of particular ecological and economic importance are some of Asia’s largest aquatic systems including the Mekong, Ayeyarwady, Red and Pearl rivers, lowlands with fertile floodplains and deltas and the Great Lake of Tonle Sap. Production landscapes reflect not only area’s geographic and ecosystem diversity, but a long history of human occupation dating back to the area being one of the first places where humans developed agriculture. Population density is 143 persons/km2, and 26-66% of people live below the poverty line. Madagascar and the Indian Ocean Islands. This hotspot has a high level of endemism, and a large area (90%) within its boundaries under production landscapes. 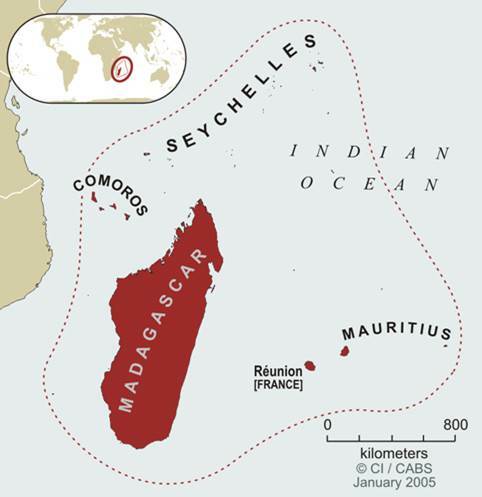 The hotspot includes Madagascar, as well as the nations of Seychelles, the Comoros, Mauritius, and the French overseas departments of Réunion, Mayotte (one of the Comoros) and the Iles Esparses around Madagascar. The natural vegetation of this hotspot is quite diverse. On Madagascar, tropical rainforests are found in the east with dry deciduous forests along the western coast. A unique spiny desert covers the extreme south. The island is also host to several high mountain ecosystems, which are characterized by forest with moss and lichens. A northern transition zone between the western and eastern forests has many of its own endemic species. The Indian Ocean islands comprise a range of relatively recent volcanic islands, fragments of continental material, and coral cays and atolls. The volcanic islands have high peaks that in the recent past were covered by dense forest. Population density is 35 persons/km2, and 76.5% of people live below the poverty line. 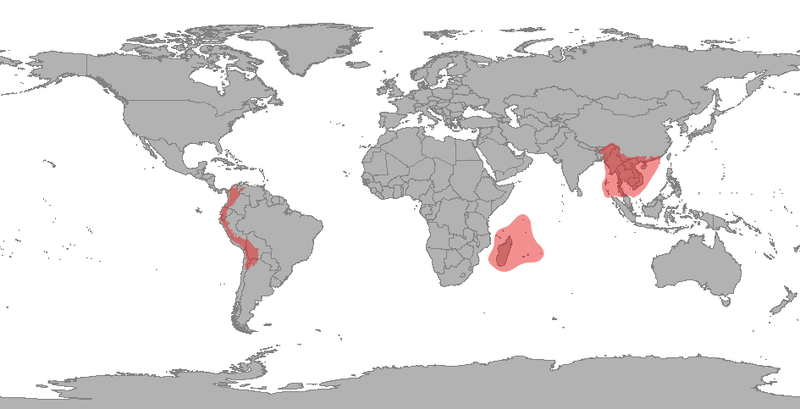 The Hotspot covers 1,542,644 km2 in Venezuela, Colombia, Ecuador, Peru, Bolivia and Argentina. 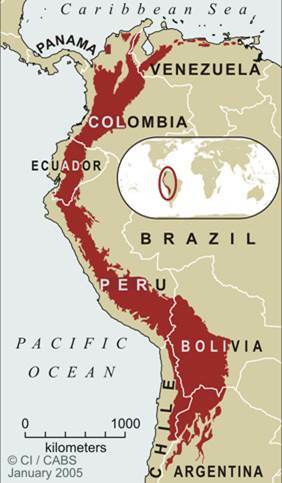 Dominating the hotspot is the tropical portion of the Andes mountain chain that runs north to south in Bolivia, Peru and Ecuador, and extending into Colombia and Venezuela. Within the Hotspot, different types of vegetation correspond to gradients in altitude. 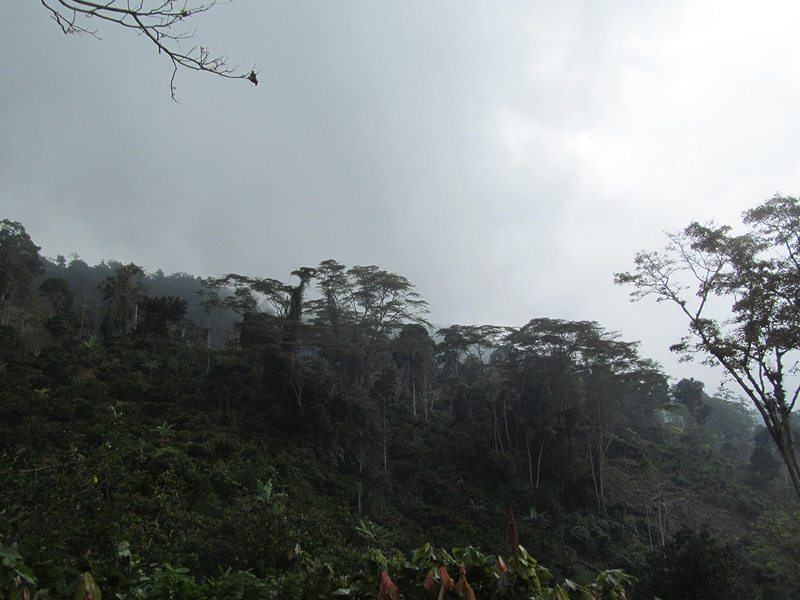 Tropical wet and moist forests occur between 500 and 1,500 meters. Various types of cloud forests extend from 800 to 3,500 meters, including montane cloud forests that cover more than 500,000 km2 in Peru and Bolivia. At higher altitudes (3,000-4,800 meters), grassland and scrubland systems reach up to the snow line. These ecosystems include the páramo, a dense alpine vegetation in the cold, humid northern Andes, and the drier puna, characterized by alpine bunchgrass species in the cold, dry southern Tropical Andes. In addition, there are also patches of dry forests, woodlands, cactus stands, thornscrub, and matorral found in this hotspot. 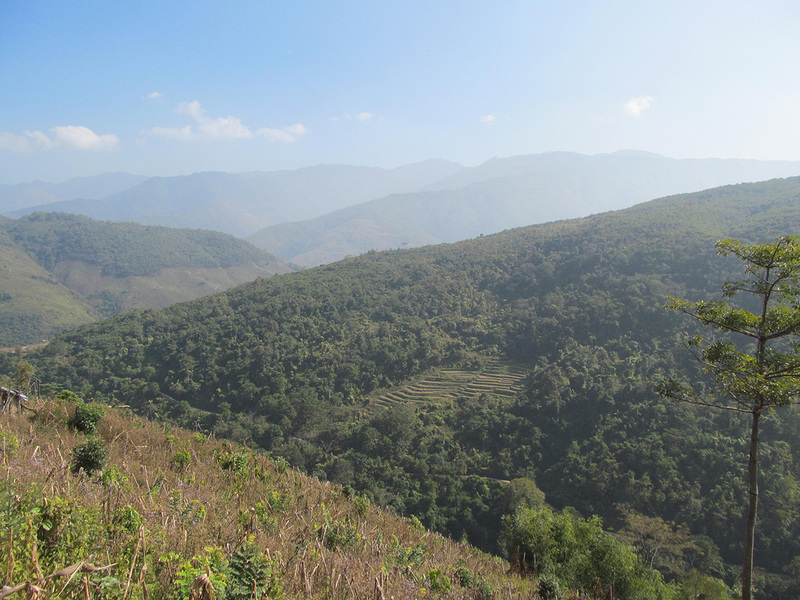 As in Indo-Burma, production landscapes reflect a long history of interaction of humans and immense geographic and ecological diversity, and a vast storehouse of local ecological knowledge. Population density is 37 persons/km2, and 8-12.5% of people live below the poverty line.